Lined with charming cobblestone streets and quaint 18th and 19th century architecture, the Georgetown neighborhood is a perfect blend of old and new. Renowned for its fantastic dining and shopping destinations, Georgetown offers an urban playground for high-fashion designer shopping, trendy dining, and its rich art and culture. Founded in 1751, Georgetown is DC's oldest neighborhood, packed with history in the every building you walk into, from the revived Old Stone and City Tavern Club to the residents of past presidents, including JFK and Thomas Jefferson. What kind of shopping will I find in Georgetown? For the ultimate shopping in Washington DC, the Georgetown Shops are the place to be! 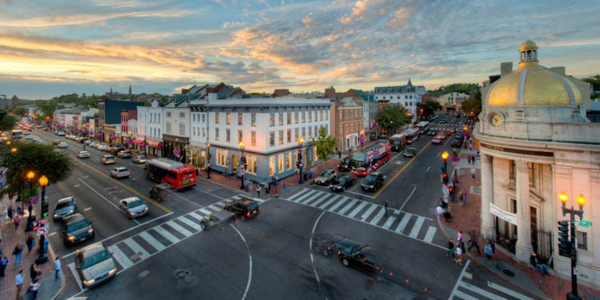 In the charming district of Georgetown proper, you will find many high-end stores, shops and boutiques. Shop your way down M Street to Wisconsin Avenue and discover unique local boutiques. From fashion to priceless art and home furnishings, to health and beauty, Georgetown is DC’s shopping mecca. What are some outdoor activities? Georgetown offers fun year-round activities for outdoor enthusiasts. Enjoy stand up paddle boarding, canoeing or kayaking under the scenic Key Bridge. Or spend the day hiking, boating and fishing at the beautiful Waccamaw National Wildlife Refuge. Explore the scenic biking, walking and jogging trails of the C & O Canal. Jump on right by our hotel and discover over 184 miles of path along the shoreline.